10th Standard H.P. Board 2019 Examinations for Regular, State Open School, Private candidates have been projected to conduct from 07th March to 20th March 2019. Also, it’s been proclaimed that regular, improvement, compartmental paper timings will be from 08:45 AM to 12:00 Noon. While SOS Exams to be taken in the IInd Shift (Afternoon) from 01:45 PM to 05:00 PM. Are you also searching for Himachal’s Class 12th Roll No? If yes, then open up this blog post here. 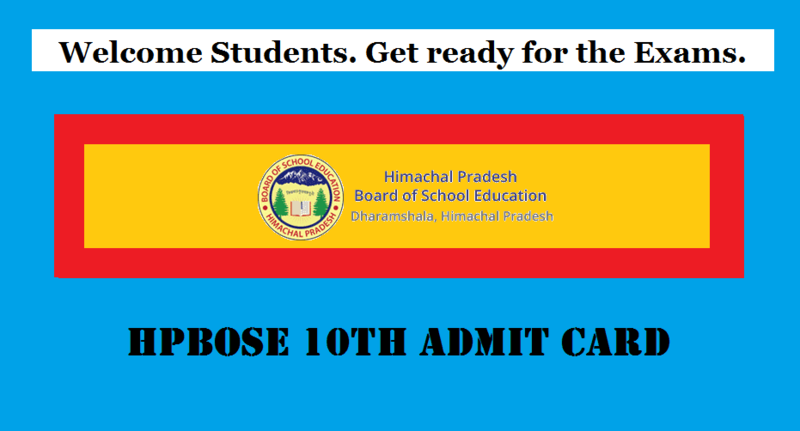 With an objective to be present and perform in board’s yearly organized public main exams, scholars will require the hpbose.org’s issued “HP Board 10th Admit Card 2019” at their corresponding test center. The released roll number of X class shall have most of the significant details furnished on it viz. Enrollment No, Student’s Name, Father’s Name, Subject Wise Paper Dates, Timings etc. An examinee must know his/her entire examination schedule and the hall-ticket or the admit-card must be carried along when going to take the respective subject’s paper. Before the theory papers, it is equally important to appear in the practical examinations. Scholars concerning the timetable of practicals should contact their school’s principal for the obtainment of an individual date-sheet. From all the corners of HP state, enrolled students are groomed up to participate in the Final Matric March Session 2018-19 Examinations. And it is believed that every individual has taken a note on the detailed programme announced by the board. Those private/correspondence registrants who haven’t joined any academic course for their studies must visit the hpbose.org, an official website of the authority for collecting information on recommended scheme, syllabus, textbooks, and prospectus. On the matter of HPSOS 2019 Admit Cards, the state open school board examinees may separately get in touch with their respective institute or coaching center or so on for getting the latest updates. Besides this HPBOSE would also make sure that all the attendees are able to search their unique roll numbers/permission letters of examinations name wise, school wise, district wise. The Matriculation Exams for all recognized Govt. as well as Pvt. schools are being organized in the state of Himachal Pradesh on annual basis. For the ongoing session 2018-19, the list of selected exam centers has also been prepared and out to check. Candidates are just one step away from taking a part in the general or vocational 10th class exams as the admit card/roll no of hpbose.org is not yet released. And as soon as it comes live on the board, attendees will get a hold of the eligibility to join in the competition. Now, I am going to finish this article by leaving a direct link of authoritative portal below from where one can check his/her roll number’s status as well as result status together with more insights on Re-appear, Re-checking/Re-evaluation and so forth. Stay connected to get more news and updates! What is my roll no. Janab Roll no search karna hai name wise hoga ya enrollment k acc. Nice Sir/mam. It greatly helps us. Sos roll no..when to come? Sos roll no….when to come? What is my roll number?